& from Wales / Cymru including Largybeg. STIFF RECORDS The Be Stiff Tour 1978 (Rare original 1978 UK vintage promotional poster for the second package tour put together by the iconic British record label, measuring 29" x 20". The 'Be Stiff' tour was designed to emulate the Motown 'revue' type tours of the '60s, where a number of bands on the same label played a small set each night, taking it in turns to headline. The striking blue 'Stiff' branding provides the backdrop for the poster with each artist written in bold red -this poster was for the University of Manchester Institute performance on October 16th and your £1.75 ticket [£2 on the night!] 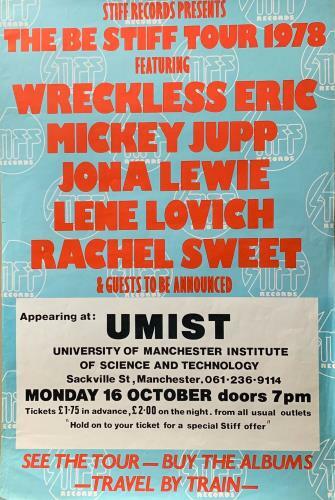 would buy you entertainment from Wreckless Eric, Mickey Jupp, Jona Lewie, Lene Lovich and Rachel Sweet - not forgetting the chance to win a "special Stiff offer"! Incredibly, this 41 year old poster remains in Excellent condition, with just some very minor corner wear and would look superb framed. It's a wonderful piece of music memorabilia connected to one of THE independent record labels - and remember, "if it ain't Stiff……." Product Information Stiff Records The Be Stiff Tour 1978 UK poster Promo.